Meghan J. Ward of adventurousparents.com contacted us last fall about our maternity panel and offered to write an unbiased review while she used it during her pregnancy. Since then, we took into account her comments and have updated our BBfit to the latest design. You can read the full article and updates here. P.S. Meghan gave us an update at 37 weeks….our panel was still working! Versatile! Start of pregnancy, during and baby-carrying. This entry was posted in Uncategorized by makemybellyfit. Bookmark the permalink. 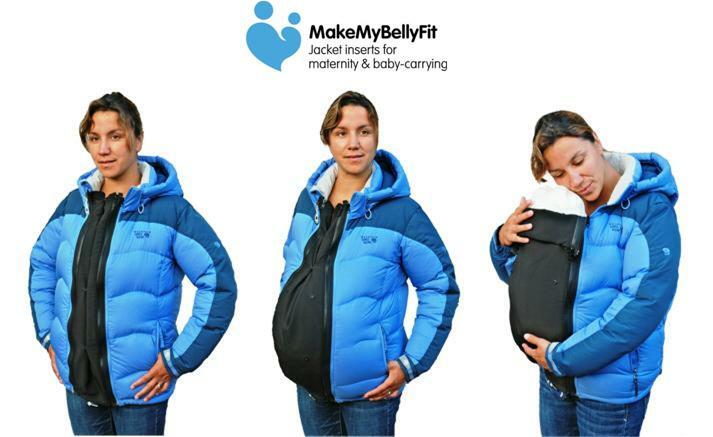 I also used it through the first two months with my newborn (it worked perfectly with our baby carrier!). It was cold outside and my husband and I would both use it to tuck our little one inside our jackets.